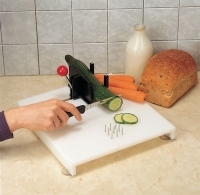 Disability Cutting Board For Weak Grip or Arthritis. When considering kitchens and food preparation for the disabled and elderly, the safety conscious will find this item of particular interest. A disability cutting board that is as versatile as it is useful, the ETAC Food Preparation System is ideal for those that have problems gripping, or perhaps are only able to use one hand. The board has a clamp to fix items like tins or bowls, and the handy stainless steel spikes keep vegetables in one place to allow easy and safe cutting and peeling. With non-slip rubber feet, this item stays where you want it to - a safe, useful and durable addition to any kitchen.